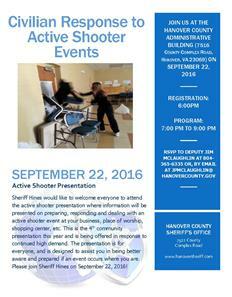 Hanover, VA – On Thursday, September 22, 2016, the Sheriff’s Office will once again be hosting a presentation in the Hanover County Board of Supervisors meeting room where we will discuss “Civilian Response to an Active Shooter Situation.” This event will begin at 7 p.m. so please arrive early to check in. The Sheriff’s Office previously hosted this event on July 14, 2016 to an audience of over 200 people. Seating is limited so please register by contacting Deputy Jim McLaughlin at 804-365-6335 or email: [email protected] as soon as possible. The presentation will focus on historical case studies and current best practices. This presentation is designed to make our community aware of what they can do to be better prepared and develop a plan should an event like this occur. The Sheriff’s Office once again looks forward to partnering with our community and sharing this vital information.